A beautifully written memoir about how life’s unexpected and potentially devastating detours lead to new roads, connections, and learning to follow the signs pointing home. As Liz Jansen approached her sixtieth birthday, she was driven to understand how the experiences of her German Mennonite ancestors, who’d arrived in Canada as Russian refugees almost a century earlier, had shaped her. Seeking answers, she got on her motorcycle and set off across the country on what she dubbed the Ancestor Trail—the places they’d lived as they established themselves in a new land. Three weeks into what she’d expected to be eighteen months on the road, a catastrophic crash threatened to sideline her quest. Instead, the ensuing time of uncertainty and stillness led her deeper into an exploration of her cultural roots. The stalwart faith and community that had sustained her ancestors through perilous times, had terrorized and almost suffocated her, leading her into what she described as a life of mediocrity. Inherently, she knew that the answers to how those experiences had influenced her beliefs and life choices, lay in delving into her distant past. To move forward, she had to look back. Crash Landing is a compelling, adventurous, and poignant personal narrative, showing how the heart always knows the way home. Liz is a member of the Writers’ Union of Canada, the Non-Fiction Authors Association, the Alliance of Independent Authors, and the Independent Book Publishers Association. 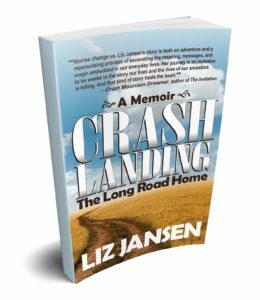 Crash Landing is her third book. She lives in Orangeville, Ontario with her cat, Measha, and Trudy, her Triumph tiger motorcycle.